Have you ever looked out at the world, then looked at yourself and thought, What can I possibly offer? We often doubt our impact. Or rather, God’s potential for impact through us. We compare ourselves to people with different lives and a different set of gifts, or look at big situations and think, I’m too insignificant. I can’t [or don’t] do that! Enter Jesus and His parables. I’m no baker, so I had to look up what three measures of flour is. Turns out it’s about 50 pounds, or 22 kilograms. That’s a whole lot of flour. But just a little yeast can leaven, or raise up, the entire batch. Jesus’ point? The flour represents the entire world, and we are the leaven mixed throughout, meant to raise up the little bit of world around us for the sake of the Kingdom. God meticulously designed each of us with a completely unique combination of gifts made for our sphere of influence, all so that others might rise up as part of God’s call and Kingdom. But what happens if we look around at others outside our radius and decide we’re not as good? What happens if we begin to think our pocket of influence is less important because it exists inside the walls of a home, or a school, or an office, instead of on some highly visible platform? Flat cakes and wanderings souls, that’s what happens. It’s good to remember that, historically, God didn’t choose the most powerful, popular, or well-known people to make the biggest impact. Take His motley crew of disciples, for example, or the incredible ways He’s revealed Himself to poor, uneducated, humble Saints. God chose them intentionally and purposefully, just as God chooses me and you. He equips the willing, not the winning. He can work literal miracles through our simple “yes,” if only we give Him the space and freedom. So catch Satan in the act when he works to divert your focus to someone else’s area of responsibility. Call him out when he tries to convince you that your role isn’t important. The last thing Satan wants is for us to grasp even a fraction of all that God can do through us. 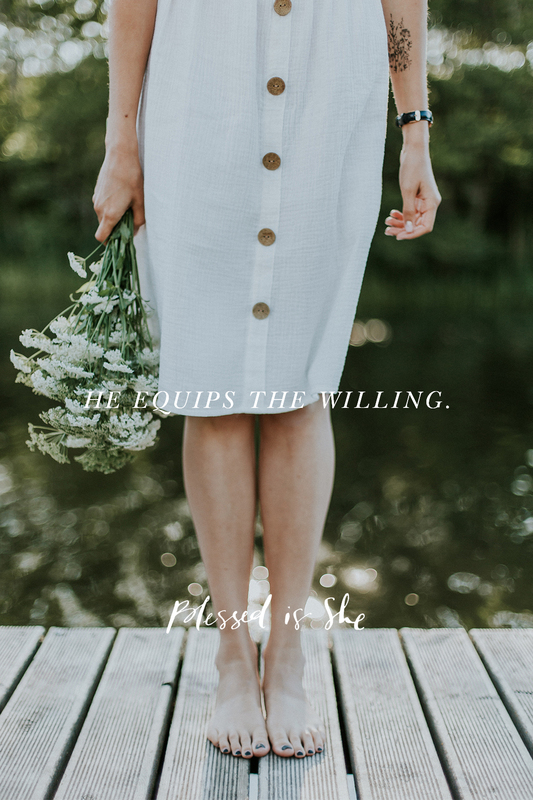 So that’s where we meet him in battle: working to recognize our God-given gifts and more freely offering ourselves as God’s instruments, in whatever capacity He needs, wherever He’s currently placed us. You may have to do some digging to discover or unpack your gifts, but they absolutely exist. If you’re still uncertain, ask a trusted companion to help identify the gifts they observe in you, or check out a Called and Gifted Workshop to learn how to identify and apply your gifts to the world around you. This is very beautiful, saving it to read again when I need the reminder. Thank you!! Thank you Kathryn, prayers as you embrace the importance of your God-given mission! As I was reading the readings this morning, I was scratching my head at the meaning of Jesus’ parables. This is such a beautiful reflection! Thank you so much! Praise God that the Holy Spirit could reach through these words to you! Blessings! I can’t thank you enough for your message. I know that God has placed me in a position to help someone desperately in need of encouragement and support at a crucial time in their lives. I believe your message is confirmation that the Lord wants me to do this. Please say a prayer for me that I will be doing His Will, not my own. Thank you. Thank you for sharing, Cathy, and prayers that His voice and mission becomes clear as you step out in faith!